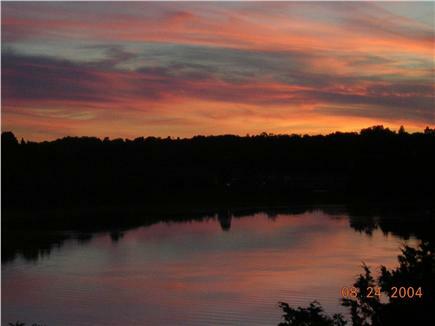 Waterfront ''Coveside Oasis'', Spectacular Sunset Views! Welcome to your Cape Cod retreat! Don’t worry about the sand on your feet! Experience a bit of the Cape Cod of yesteryear. 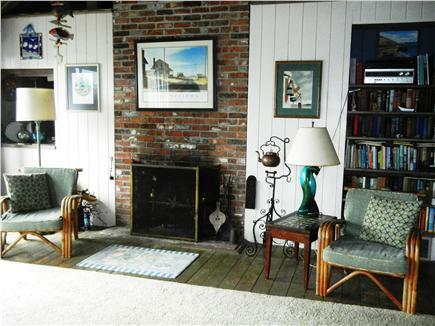 This rustic 50 year-old Cape Cod ranch is located in exclusive East Orleans area on private dead-end road surrounded by beautiful Town Cove and Nauset Harbor. You'll be mesmerized by this secluded setting on one acre overlooking tranquil Rachel's Cove. The second and third generations of our family so enjoy the house and its location that we offer only a limited number of weeks to guests. So grab your week now! Enjoy a peaceful breakfast overlooking the water on the spacious deck (sliding glass doors from living room and master bedroom). 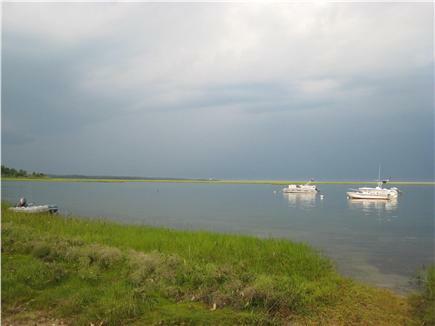 Launch your kayaks or canoes out back at high tide (or any time at the end of the dead-end road) and paddle to Nauset Marsh or the outer barrier beach. 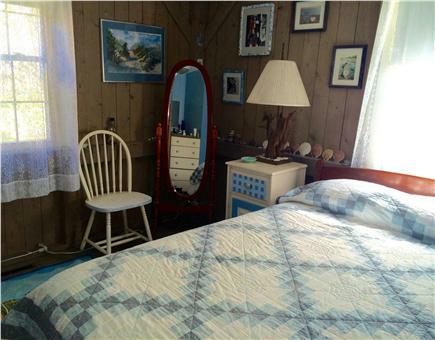 Only a 5 minute drive to pristine Nauset Beach or the calm waters of Skaket Beach. Return home and revive yourself with an outdoor shower and cocktails on the deck, taking in the glorious sunset view. 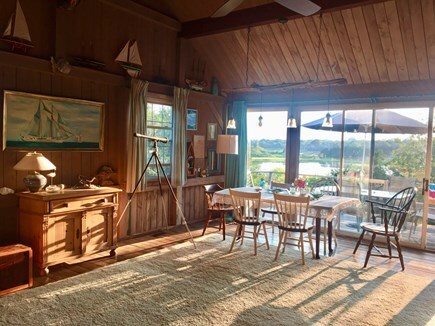 There is a huge bright living/dining room with cathedral ceiling, exposed beams, and an uninterrupted view of the cove. 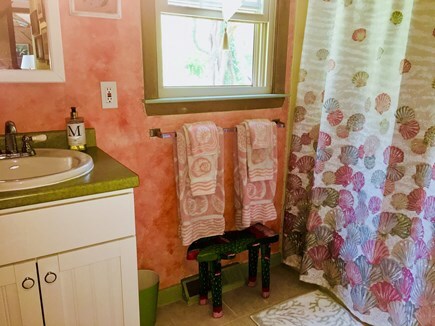 This private setting is only minutes from Orleans' restaurants and shops, saltwater beaches and freshwater lakes, and the Cape Cod Rail Trail - a great getaway for one or two families (your dog is welcome, on approval). Couples or families with young children: Consider June or September - a beautiful time to visit, much quieter and considered by locals to be the nicest months. Additional availability info: Open to adding additional nights or starting/ending on different day if available. This is a Saturday to Saturday vacation rental. Additional pricing info: Free week with full month rental (June and September), State and local taxes of 12.45% will apply. We were surrounded by water. 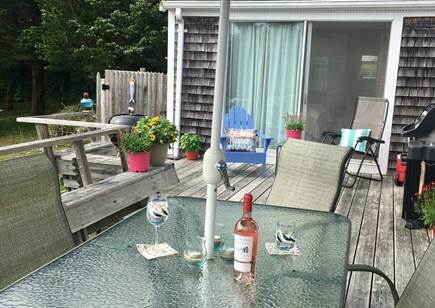 The back deck looked out on Rachel Cove and in the background there was a constant flow of boats back and forth in the town cove channel. I could have spent the entire week watching the colors of the water and sea grass change over the course of a day. Across the street was a (pretty well hidden) public access path to Woods Cove. Those neighbors were pretty friendly and OK with us anchoring our 15' whaler there. (deeper than Rachel Cove). We pulled our kayaks up on the narrow public swath of shoreline. A quick hop across the very beautiful and alive Nauset Harbor brought us to the barrier beach and an ocean with spots during low tide that got a nice shallow flat break good for body surfing. We hardly ever got in our car. There was a public dock in Town Cove just across from a fish market, liquor store, supermarket, waterfront bar/restaurant tackle shop and boat supplies. We didn't need anything else. Otherwise the bicycle ride into town was a safe and easy 3 mi ride. The runners in our group were very satisfied with the routes they found. It was hot, but the house was cool with fans in the rooms and a big open high ceiling room with a great ceiling fan. We were six very comfortable people and the house was so nice and well equipped that we rarely wanted to go out for dinner. Rather there was a crew in the kitchen, another manning a very nice grill while the rest of us hung out on the deck with drinks, conversation and a good book. The yard was great with lots of spots with cool shade and comfort. The shower was awesome. The house felt like a home, It was our center, we all wandered from it doing whatever we wanted, little complicated planning was needed. 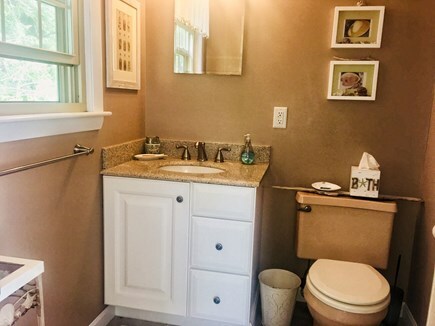 We rented this house last year and decided to return this year to this cozy and private house in a great Orleans neighborhood. Perfect Cape experience. Great outdoor shower, and the sunsets from the deck are stunning. Highly recommend this home. Secluded house in a nice, private, Orleans neighborhood. House is well stocked and clean. Excellent outdoor shower. The view of sunsets from the deck is beautiful. House is close to beaches and shops. Would go back again. We stayed here a few years back when it was just my wife and I and we loved it. We came back this year with our 4 and 5 year olds and still loved it. 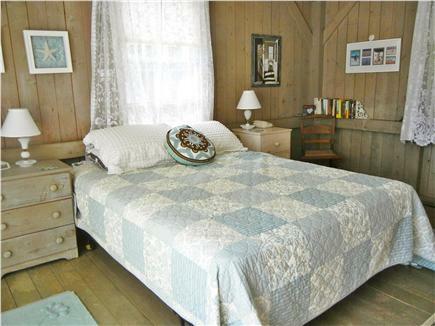 The house is beautiful and comfortable and tucked away but a very quick drive to anywhere you want to go. The boys loved the bunkbeds and we all enjoyed a beautiful week of beach time. Coveside Oasis did not disappoint. It was so peaceful and scenic we did not want to go home. The outside shower was so refreshing, and what a view! 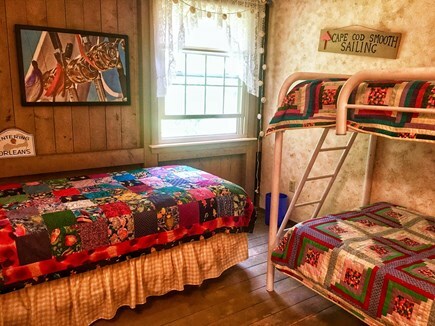 Although the house is a little rustic, the kitchen has everything you could ever need for a vacation house, and the cabin interior gave it real vacation charm. The layout of the house was also well planned out and took advantage of the spectacular view. So pleased with the house and location! Thank you H & H, was a pleasure renting from you. Walk through the front door and view a wall of glass, sliding doors and floor to ceiling windows looking out at the blue water of Orleans Town Cove, sea grass swaying in the breezes, and waterfowl enjoying their natural habitat. Everywhere you look is Cape Cod personal collections. It is like visiting a museum but in a friendly, homey environment. 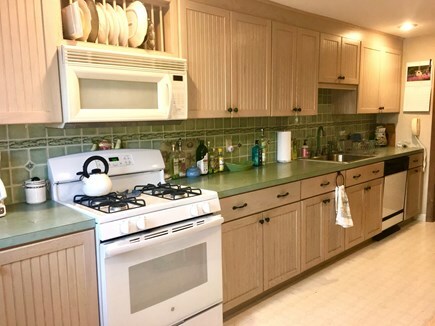 The kitchen was fully equipped and a joy to cook in and prepare for beach picnics at Nauset Beach, which is just a few minutes away by car. 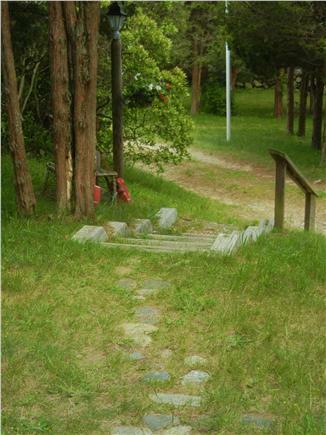 The house is in a very quiet setting where you can enjoy a walk or just sitting on the deck enjoying nature. We thoroughly enjoyed our week. The view overlooking the cove from the deck was breathtaking, and we loved sitting out there watching the hummingbirds, egrets and hawks. The house was clean, kitchen had everything we needed, and we enjoyed all of the interesting collections of heartstones, sea glass, etc. 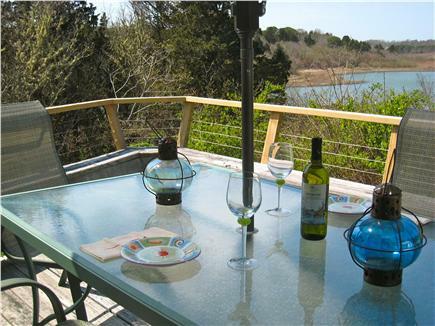 The location was perfect, tranquil and quiet yet close to restaurants and beaches. 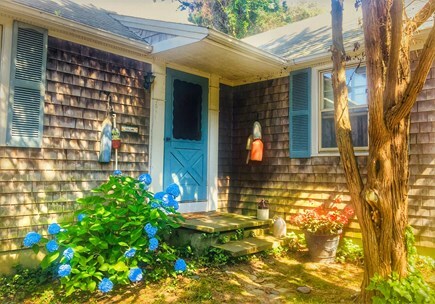 We would love to return to this charming Cape Cod home!